I am taking over development of this mod once again for the time being! Make sure to report issues to the Github. 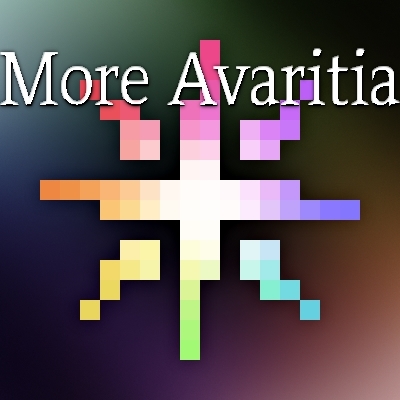 This mod adds Avaritia recipes to otherwise unobtainable items from many other mods! A few examples are the Creative Capacitor Bank, Creative CAD Assembly, Guilty Mana Pool, and much much more! NEW- Infinity-1 Tools! Aka Infinity Minus 1 tools, which only cost diamonds and nether stars to make, yet are still powerful with infinite durability! Infinity-1 Pickaxe: Works as a multitool, and can shift right click between fortune III and silk touch! Infinity-1 Hoe: Infinite durability hoe, works in farming stations. And more like a Sword coming soon! A list of all items I added recipes to can be found at my here on my wiki! If you have any suggestion for recipes you would like added, or even new powerful items/blocks you would want to see in the game, either message me or leave them here marked with [Suggestion] in the title! MAKE SURE YOU CHECK MY WIKI PAGE FOR ITEMS NOT I WON'T BE ADDING BEFORE MAKING A SUGGESTION. I put items I know about but didn't add on purpose there. ~If you wanna donate some mining hashes or bitcoin to me for whatever reason my address is "32z6L9bzkUeagejdtzLSLqM8wgbdE2UiCe". And lastly it is an avaritia addon, if you were expecting super easy recipes then you are using the wrong mod. can you add a recipe for the creative sacrificial dagger in blood magic? it fills the altar without hurting you. Glad you're taking an interest in the mod! But please leave all mod suggestions here so I can have a good way of keeping track of them! Thanks for telling me. The link is fine just for some reason curse is bugging out, so I just removed the link altogether and tell people to look at my wiki, as it has the list there. Fixed basically all recipes now! Shouldn't have any more crashing or not working recipes. Fixed all crashes and in the process of fixing the recipes that are still not working.